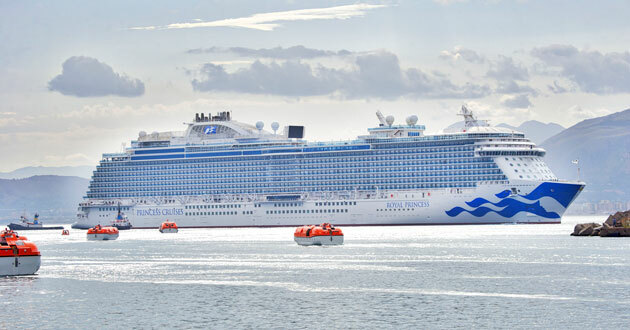 (12:50 p.m. EDT) -- Princess Cruises' lineup of California coastal sailings for 2019 and 2020 includes a debut for Royal Princess, as well as longer time in ports like San Francisco and San Diego. Royal Princess will sail nine departures from Los Angeles on a "Classic California Coast" itinerary, stopping in Monterey, San Francisco, San Diego and Ensenada. "Bringing Royal Princess to the West Coast for her first season is just one of the ways we are solidifying our commitment to providing our guests even more opportunity to sail the California coast," Jan Swartz, president of Princess Cruises, said in a news release. The line, well known for West Coast itineraries, sails year-round from San Francisco; Grand Princess will continue to make departures throughout 2019. A new itinerary for the season includes a five-night "West Coast Getaway" featuring a call to Ensenada and a longer call in San Diego, which provides passengers the opportunity to try the Princess' "More Ashore" shore excursion program. Star Princess once again will sail the West Coast from Seattle and Vancouver in 2019, on seven- and 10-night cruises of Northern California that include late-night or overnight calls in ports like Victoria, Los Angeles and San Francisco. Ruby Princess and Island Princess will continue their tradition of cruising the West Coast, on itineraries like "Pacific Wine Country" into the new 2019/2020 season. Onboard, Princess passengers on West Coast sailings can enjoy enrichment like a behind-the-scenes look into the music and movie industry of L.A. with celebrity presenters through the line's "Encounter with Discovery at SEA" program. In addition, some speakers will join as judges on the panel of your ship's "Voice of the Ocean" singing competition. Special shore excursions have also been developed in partnership with Bill Esparza, author and expert on Latin American cuisine, to guide passengers through the culinary landscape of California. Excursions to wine country are also available.